Political risks in Asia have increased. Asia currently ranks above the world average in terms of political risk, behind the Middle East and North Africa (MENA), Sub-Saharan Africa and Latin America. 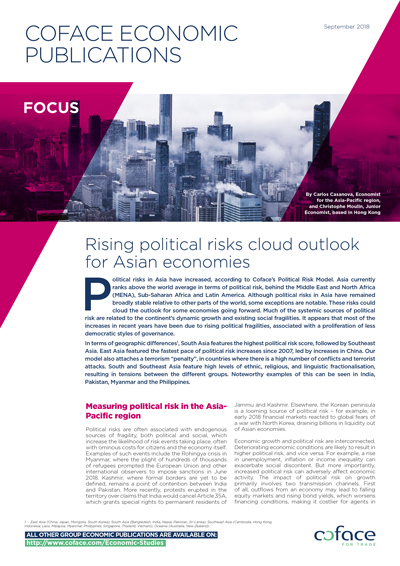 Although political risks in Asia have remained broadly stable relative to other parts of the world, some exceptions are notable. These risks could cloud the outlook for some economies going forward. Much of the systemic sources of political risk are related to the continent’s dynamic growth and existing social fragilities. It appears that most of the increases in recent years have been due to rising political fragilities, associated with a proliferation of less democratic styles of governance.